Since our last party (and my attempt at hummus), I’ve been working my way through a jar of tahini. I make it into sauces to put on asparagus, spinach, tofu, and more. Tonight, I took it one step further and combined it with my new favorite winter grain – quinoa – for a perfect sweet and exotic autumn dish. It’s light, colorful, and super tasty. Try it and tell me what you think! Blend (or stir) all the items in the sauce together in a small mixer until ingredients are well combined. Place the salmon in a foil-lined pan and spread the top and sides with the tahini mixture, taking care not to touch your fishy utensil back into the rest of the sauce. Bake the salmon for 15-20 minutes. Boil 1 1/2 cups of water (for the quinoa). When the water is boiling, add the quinoa and cook covered for 12 minutes, stirring often. When the water is almost entirely absorbed, throw in the cranberries. In a skillet, saute the onion, butternut squash, and garlic together until lightly browned. When the quinoa is done cooking, remove from heat and stir in the cooked vegetables. Let sit for 5 minutes. 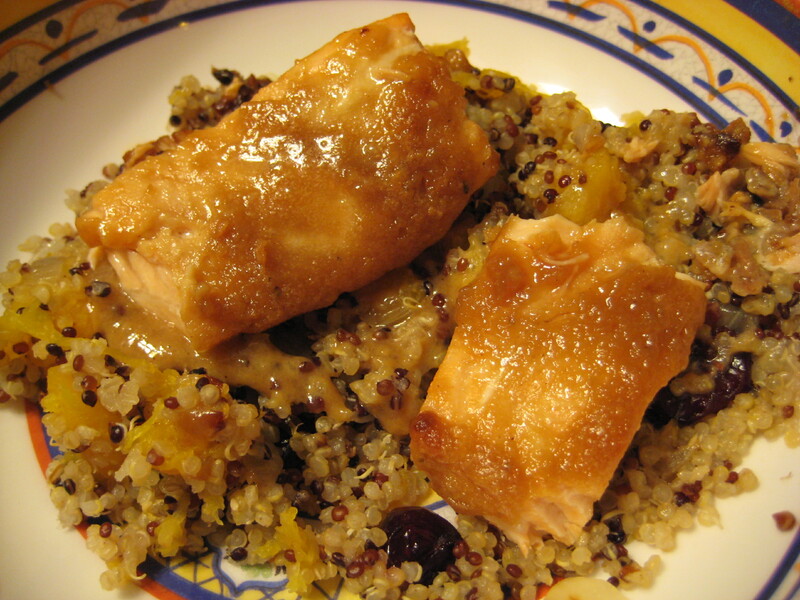 Serve a portion of quinoa topped with a spoonful of tahini dressing and a piece of salmon. Eat warm, serves about 4.